This unusual name is of Olde Norse origin, and is a locational surname deriving from the place called 'Garstang' in North Lancashire, an area that was widely settled by Scandinavian invaders in the 8th Century and 9th Century. The placename is recorded in the Domesday Book of 1086 as 'Cherestanc', and in the Lancashire Pipe Rolls of 1195 as 'Gairstang', and means the 'gor' by the boundary pole. The derivation is from the Olde Norse 'geiri', a gore, or triangular piece of land, from 'geirr', a spear, with 'stang', pole or boundary marker. Locational names were usually given to the lord of the manor, and especially to those former inhabitants who moved to live or work in another area. The Will of one Andrew Garstang of Leyland was proved at Chester in 1616, and John Garstang married Grace Aspinall on the 7th April 1656 at Padiham, Lancashire. 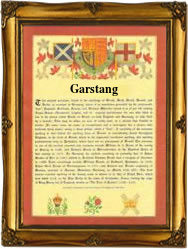 The first recorded spelling of the family name is shown to be that of John de Gairestang, which was dated 1379, The Yorkshire Poll Tax Returns, during the reign of King Richard II, Richard of Bordeaux, 1377 - 1399. Surnames became necessary when governments introduced personal taxation. In England this was known as Poll Tax. Throughout the centuries, surnames in every country have continued to "develop" often leading to astonishing variants of the original spelling.